Made from elegant smooth satin that has a lustrous sheen, these custom ties are the epitome of class. Carefully printed on both the front and back, this is an exceptionally made necktie. From everyday office wear with a touch of a personality to events that require something special, make your own tie that perfectly complements the occasion. No minimum requirements. 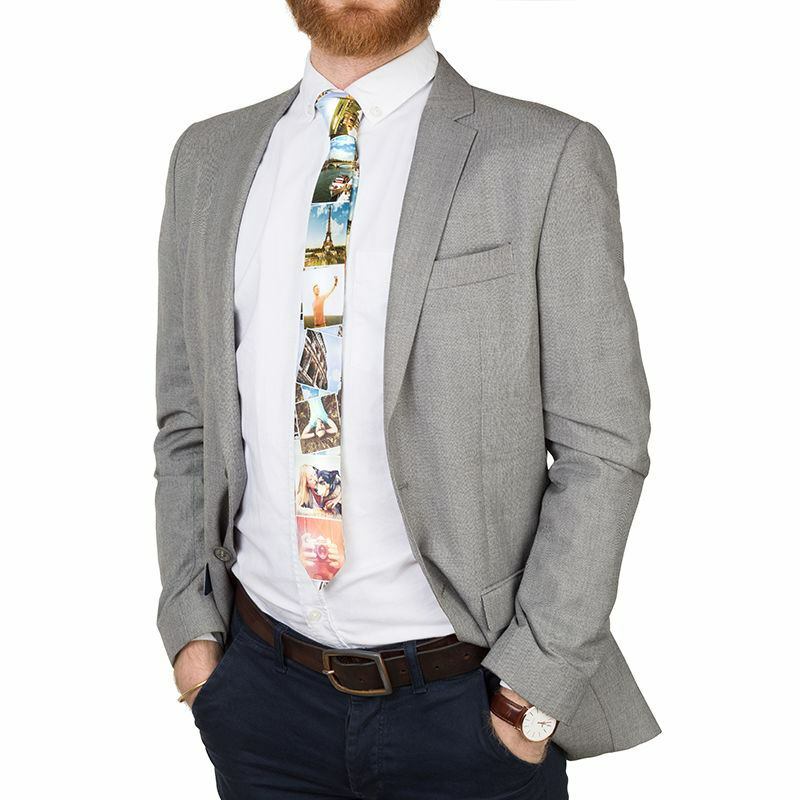 Make your own tie using your original artwork for a truly distinguished accessory. Made from smooth satin in either skinny or wide styles, you can create a necktie that adds the finishing touch to your shirt and suit. The deep, rich print on both sides, and subtle sheen from the fabric produces an excellent finish turning any outfit into an impeccable fashion statement. You can make your own tie for a myriad of situations; patterned ties are perfect for livening up plain suits, funny ties are an ideal promotion tactic and novelty ties are a favourite holiday staple. Expertly crafted, your custom ties are designed to last. Keep it traditional with this classic necktie. At 90mm wide, it's a solid choice for giving everyday apparel that extra sophisticated finesse. A timeless accessory. This 60mm skinny tie is a fashion essential, turning smart outfits into trendy style statements. You can easily go from office to night out wearing your skinny tie. The specialist printing process we use to infuse the satin fabric with ink ensures your design is long-lasting without succumbing to fading. We print the necktie all over, so whichever way its styled your design will always be on show. Unique ties are a complementary addition to any men's clothing fashion brand. When we heat press on the tie, the fabric shrinks slightly resulting in a thin white line running along the seam lines at the back and on the edges of the fabric (See photo in gallery). We cannot guarantee 100% accuracy due to the way textile stretches and moves in the printing process though this will not show on the front of the tie and will not alter the overall quality of the product. Everybody loves a snappy suit, but even more so when there's an extra touch of pizzazz. For a casual day at the office, pair your custom ties with a shirt and chinos or tuck it behind a waistcoat to introduce more formality. The skinny tie is a trendy style piece, so wear with skinny jeans and a blazer for a modern day take on the smart/casual dress code. Great Tie! I designed the tie especially for a reception at the Victoria and Albert Museum, 3/4/19. It was a 60's event. The tie looked fabulous. Received many compliments on the tie at the event. Tie was printed in 24hrs and I am super pleased with the tie. Better than I expected ! Product quality far exceeds my expectations. Fantastic turnaround and cannot fault the whole process from start to finish. Perfect and Very Quick Service I ordered a beautiful blue tie with an own-designed tiny aeroplane pattern, and it came out great. Great printing quality and precision for the price. The only thing preventing a continuous flow of orders by my side is the delivery price in Switzerland, even if I have to admit that the speed was astonishing. Very Happy I wanted to make a Tie from a photo of my sons graffiti as he was killed a couple of years ago and I will be doing some TV work and wanted something of him with me. The Tie is wonderful and I can not wait to wear it on TV to show off his work. The quality of the material is really good and I am very happy with it. Fantastic Product quality is excellent, delivery was really quick and customer service was great! Quick efficient and good quality I urgently needed a tie with a specific design, the software was easy to use and being able to review and save changes is great. Online help ensured that i could get express delivery. Amazing to have it printed in 24hrs and delivered so fast. Great quality and service would highly recommend. Thank you. Great Quality! Amazing, great quality and fast service! Amazing service Really good quality fabrics and vibrant colours, also super quick postage. Do these ties have a keeper loop? Our custom ties do not feature a keeper loop, however if you prefer to keep your tie as secure as possible, you can use additional accessories such as a tie clip or a tie pin. What is the tie made from? Your tie is made from a luxury satin fabric which gives any style a touch of elegance and panache. Whether you opt for the traditional wide tie, or the more modern skinny tie, this is an amazing accessory for any look. How do you print my custom ties? Your design is repeated on both the front and back, where we press and then print onto the flat surface. This means your unique ties are self-tipping, as the inner lining is left white. A fine white line is slightly visible on the reverse. Choose from a selection of independently designed ties by our Contrado Creatives artists.